Eta’s Commercial Kitchen Rental is a fully equipped, commercially licensed, shared use kitchen located in Highland Park, IL, available 24 hours a day, 7 days a week. Prospective clients should call or send an email to Rick in order to set up an appointment to see the kitchen. What do I need to start using the kitchen? How Do I Reserve Kitchen Time? Kitchen time is reserved on a first come first served basis unless other arrangements are made in advance. 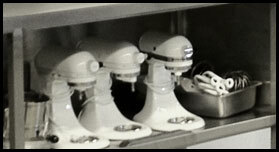 All renters are responsible for cleaning their work stations (equipment too) as part of their kitchen use. We subscribe to a towel service, and will supply all the necessary cleaning supplies to make cleaning up a breeze. Payment is due after each kitchen session unless other payment arrangements have been made. Monthly renter’s rent is due at the beginning of each month. Unused hours do not roll over to the following month so please plan accordingly.